On Saturday 24th the IWM Duxford based Catalina G-PBYA flew an orbit over Loughshinny where Harry Hawker’s attempt to fly a Circuit of Britain had come to an end. The Catalina completed the Circuit of Britain on Sunday 25th August 2013, nearly 100 years after the first attempt. On Wednesday 28th, Jeff Boyling paid a visit to Loughshinny to meet some of the locals involved in their own commemoration to Harry Hawker. Jeff was met by local resident Cepta Butler, Kevin Murray of the Loughshinny Historical Association, aviation historian Bob Montgomery and Councillor Ciaran Byrne. It was a sunny day and the scene of Harry’s mishap was inspected along with the plaque unveiled on the Sunday by a representative of the Australian Government. 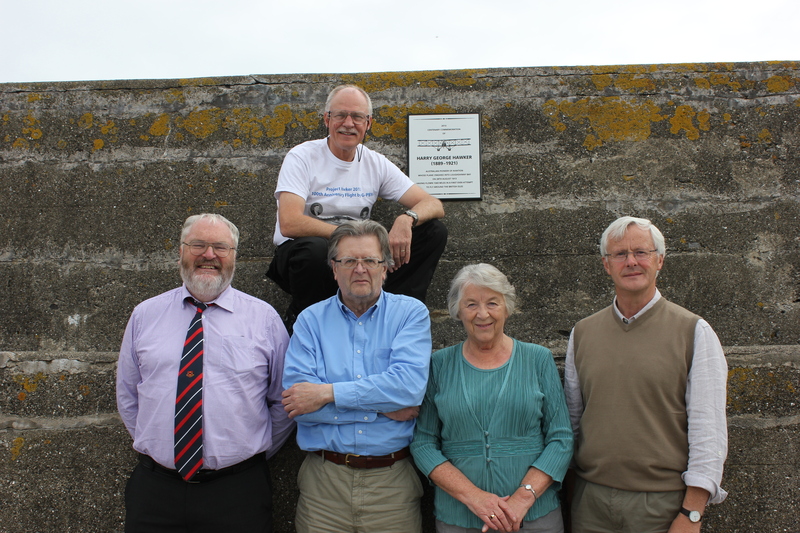 From left to right Ciaran Bryne, Bob Montgomery, Cepta Butler and Kevin Murray with Jeff Boyling by the Plaque. This entry was tagged Aberdeen, BAA, Beadnell, Brooklands Museum, CAA, Calshot, Catalina, Classic Air Force, Classic Boat Museum, Cromarty, Dingwall, Dublin Weston, Dun Laoghaire, Durham Tees Valley Airport, Falmouth, Gorleston-on-Sea, Great Glen, Hawker, Hook, Invergordon, Isle of Wight, IWM Duxford, Kiells, Kingston, Lands End, Larne, Loughshinny, Montrose, NATS, Netley Chapel, Newquay Cornwall Airport, Oban, Pembroke Dock, RAF Leeming, RAF Leuchars, RAF Lossiemouth, RAF St Mawgan, RAFBF, Ramsgate, Scarborough, Seaham, Solent Sky Museum, Sopwith, Southampton, Sunderland Trust, The Irish Independent, The Irish Times, Tower Bridge. Bookmark the permalink. What a great conclusion to the commemorative flight. Well done Jeff.